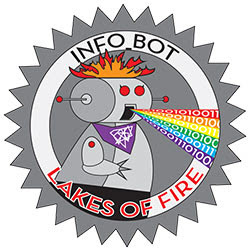 We at Info_bot want to thank you for creating an incredible experience for all of us! Whether you spent the last six months building an elaborate bar top or you strapped on the construction-paper monster mask you made in the car on the way up, you made this burn special and unique. Please take our yearly post event survey so we can use your feedback to guide our plans. This will help this year’s Team Leads make decisions for 2019, so spread the word amongst your campmates – the more people who answer, the better info we’ll have going forward. What theme would you like to see for Lakes of Fire in 2019? Submissions are open! We will close down the suggestion form before the Leads have their Fall Retreat, and they will select a bunch for final voting by all attendees. The artwork was tremendous, the sights were delightful and the vibe was fantastic. We’re grateful for all the artists, builders and campers who shared their work creating Bedtime Stories. Special thanks to Katie and Bill, our photo_bots who took these great photos for us! If you see a picture of yourself you’d like us to remove, no problem! Just let us know @ info@lakesoffire.org! All of the Volunteer hours for Bedtime Stories have been submitted for 2019 ticketing consideration. If you didn’t receive an email from the team(s) you volunteered with, please contact them asap through the email address on their department page. Thank you again for doing all you do to help make LOF awesome! We at Info_bot would like to say that it has been a pleasure to serve you this year and every year. You are part of an incredible community of makers and lovers. Thank you for helping by bringing your best selves, both online and in person. We love you to pieces. If you think you have the temperament and mastery of language to help moderate our online community, please contact us!